The main purpose of the project was to investigate if climate change in the form of increased temperature would affect the transport of contaminants to the Arctic. ArcRisk is an international EU funded research activity that is looking at the linkages between environmental contaminants, climate change and human health. The Arctic is particularly sensitive to climate change and already exhibits clear impacts. How can we limit environmental contaminant? Which are the most important pathways? How are the studies done? Measurements have been conducted in e.g. snow and biotic samples as well as in the marine enviornment. How much pollutant one is exposed to, depend on factors such as - where we live and our habits. 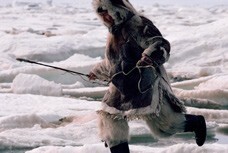 So how are the human in Arctic exposed? When we know what climate change affect means for Arctic, we can prepare strategies for adaptation, and for the prevention of adverse health outcomes, related to climate-mediated changes.